If you’ve been following us for a while, you would know that we love trying different foods and cuisines. So when we learned of Winestone, we were excited to try out their food as they serve a fair selection of Mediterranean dishes. 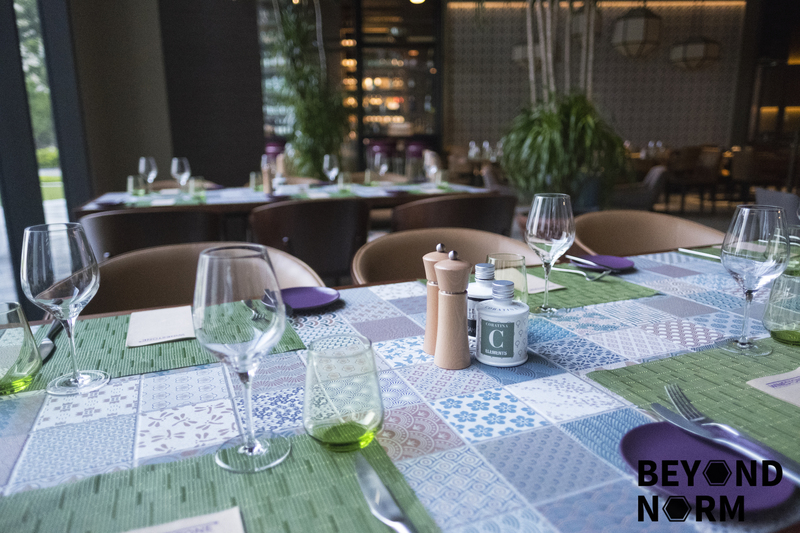 Since opening its doors on the 22nd of January 2018, it has been an up and coming dining spot for couples and families alike. It is one of the many pods in the Oxley cluster surrounding Mercure and Novotel on Stevens. 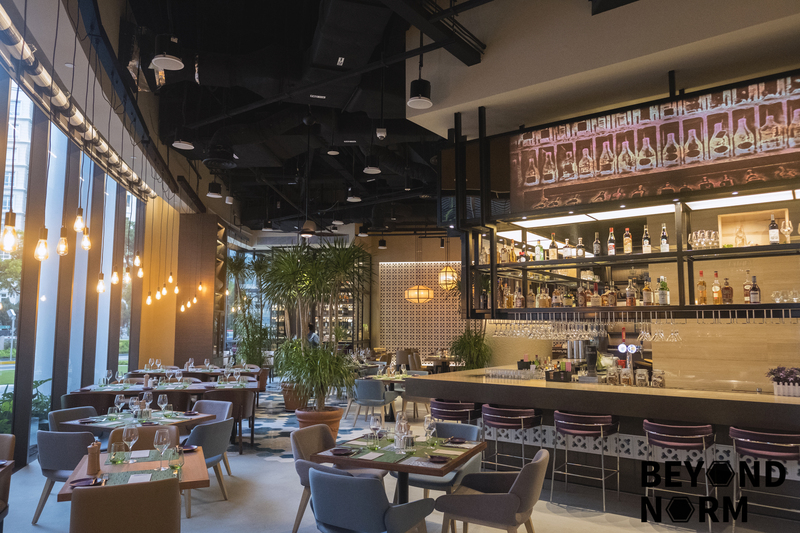 Winestone is aptly named as the name is derived from two prominent factors when dining at the establishment; they have a wide selection of wines and many of their meals are served on stone boards. Housing Mercure’s morning breakfast during the day, Winestone breaks off into an independent dining concept of its own after noon. We ordered a variety of different dishes to be shared amongst everyone on the table. 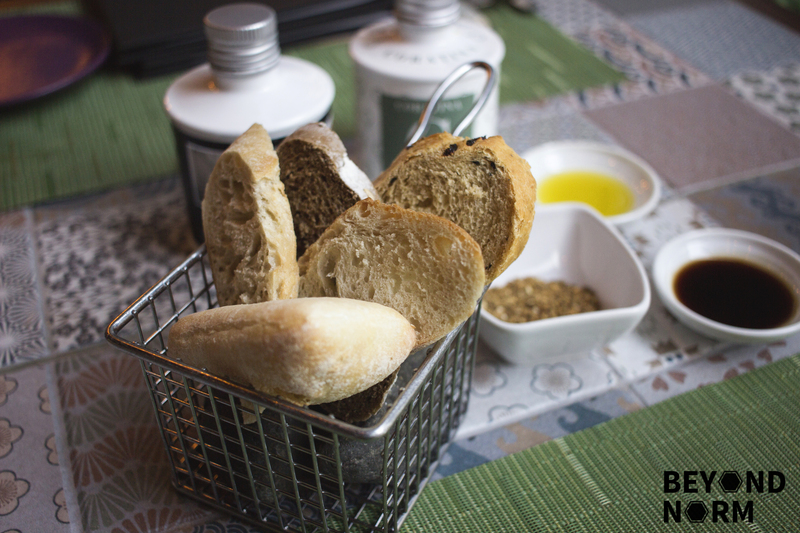 To start, we were served an assortment of bread, such as their dark rye sour khubz and mini ciabatta bread, set above some stones. The interesting part is that the stones are heated to keep the bread warm. But the highlight of it all was the dukkah which had such distinct and unique flavour compared to other condiments that I’ve tried before. Shortly after, the Mixed Platter ($28) arrived. 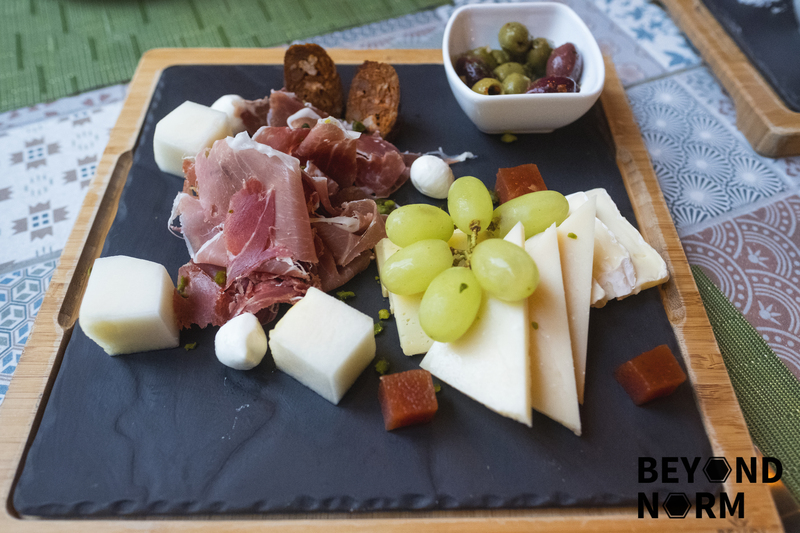 On the stone board was a variety of cured meats (Jamon Iberico de Cebo, Prosciutto Parma, and Spanish Chorizo), cheeses (Parmesan Reggiano, Brie de Meaux, and Tomme de Savoie Fermiere), olives, rock melon and quince paste. What stood out to me the most was the chorizo, as it was tender, juicy, and flavourful; quite unlike the other chorizos that I’ve savoured in the past. 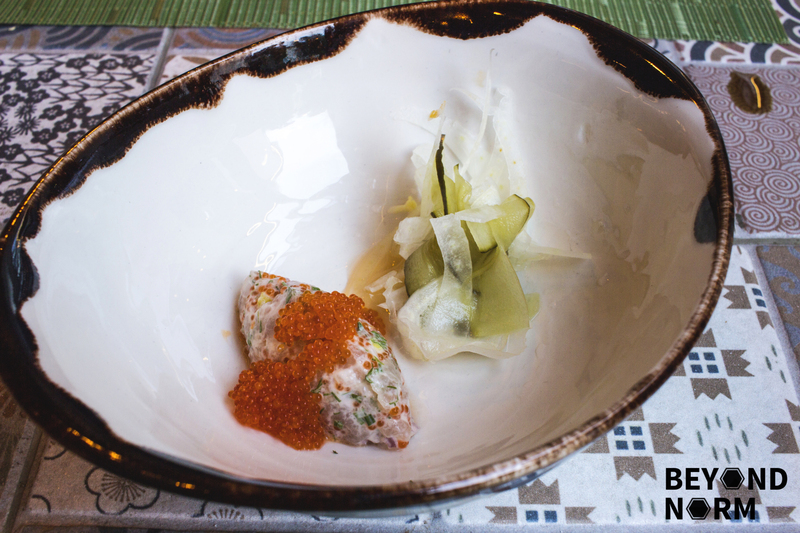 One of my personal favourites was the Mackerel Tartar ($22) with caviar and pickled vegetables. It had a nice variety of textures. The mackerel was smooth whilst the caviar helped to mix up the texture and give it a bite. The overall flavour is slightly sourish and tangy which I enjoyed very much, however it may not suit everyone’s taste buds. 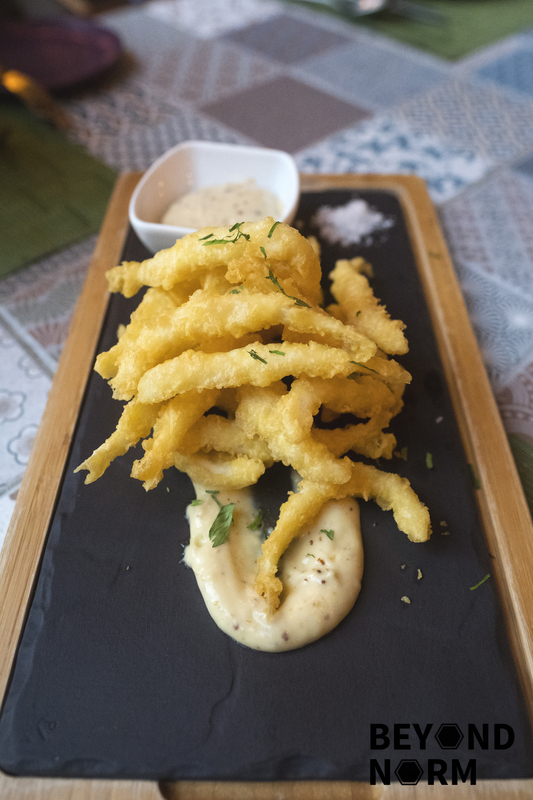 The Battered-Fried Whitebait ($12) were nice and crisp, but a bit on the plain side. However, the grilled lime and garlic aioli dip went along well with the whitebait. Ricotta Veal And Meatballs ($14) with soft polenta and pomodoro sauce was on the slightly drier side but rather flavourful. 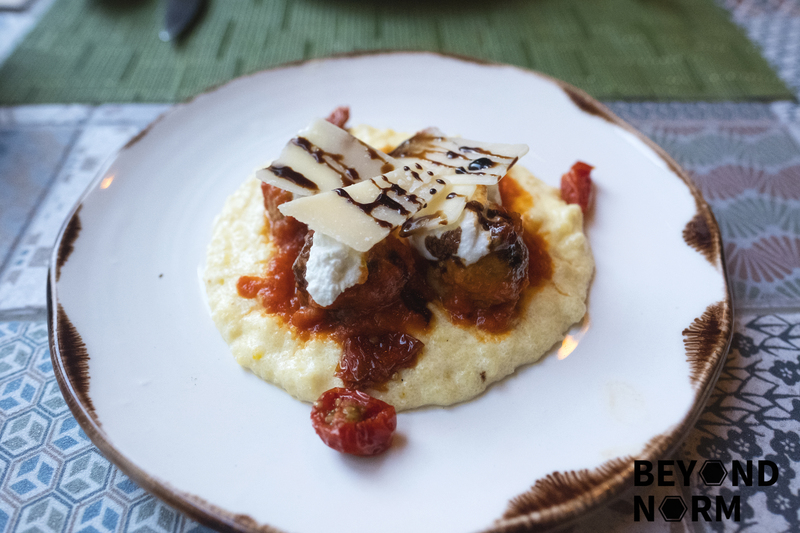 The polenta was tasty and imitated the texture of a rustic mashed potato. Seared Scallop ($16) with chorizo, truffled parmigiano and crushed peas was up next. It was definitely a unique pairing of scallop and chorizo as I had not seen them paired together prior to this. The scallop was nicely seared whilst the chorizo was tender and had a nice meaty flavour. 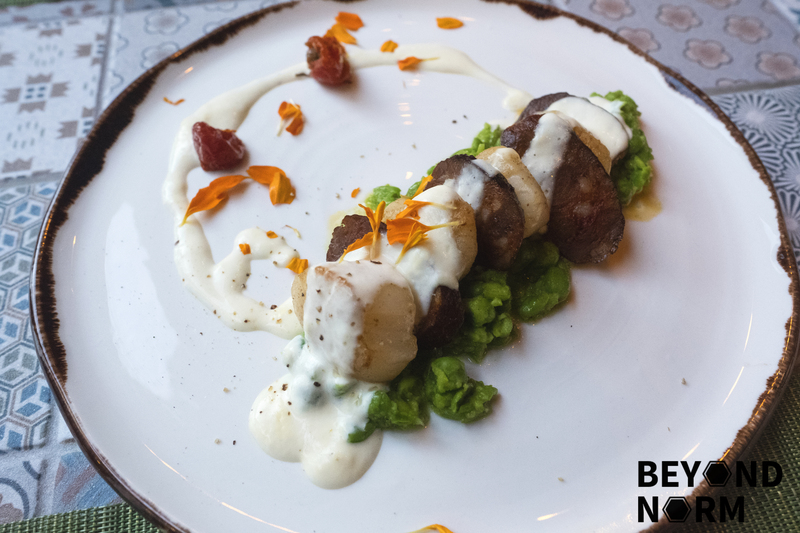 The unusual contrast of flavours and textures really complemented each other well. 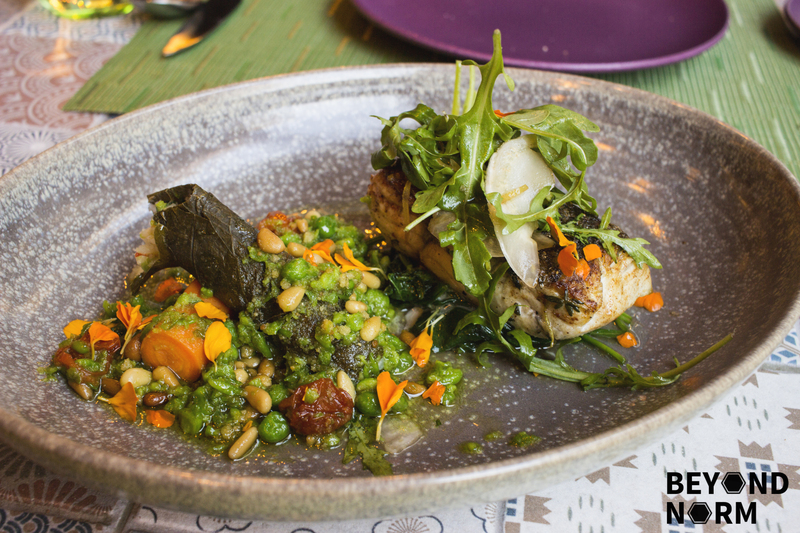 The Sea Bass & Dolma Prawns ($26) was served with peas and nut brown butter. The dish itself was very simple but played a lot on the freshness of its ingredients. The fish was fresh and cooked to perfection with a nice char flavour. But the star of the dish was the dolma prawns mixed with some rice and spices, then wrapped in grape leaf. The nut brown butter added the final touches needed to satisfy the palate. 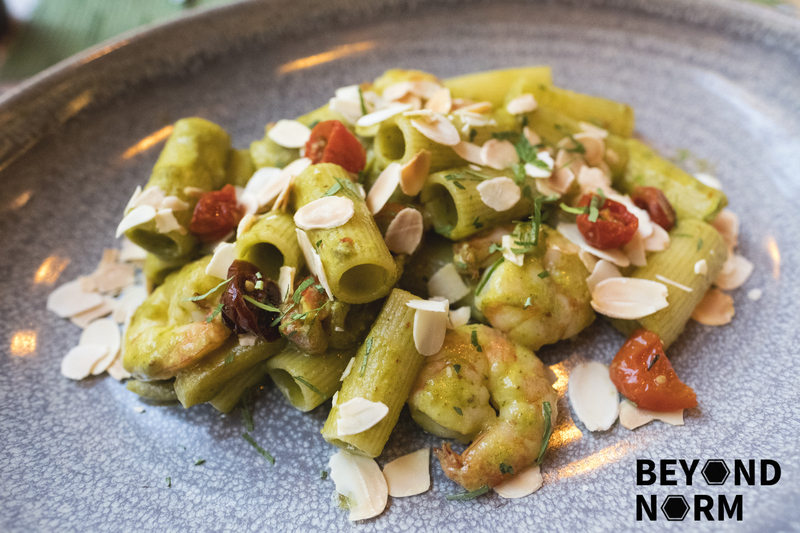 The Rigatoni Prawn ($26) with smoked roasted capsicums, basil, aged parmesan, and almonds had a unique blend of textures and flavours. The penne was al dente and the almonds gives the dish a nice crunch. Overall, it was slightly spicy and peppery with a good blend of earthy flavours. 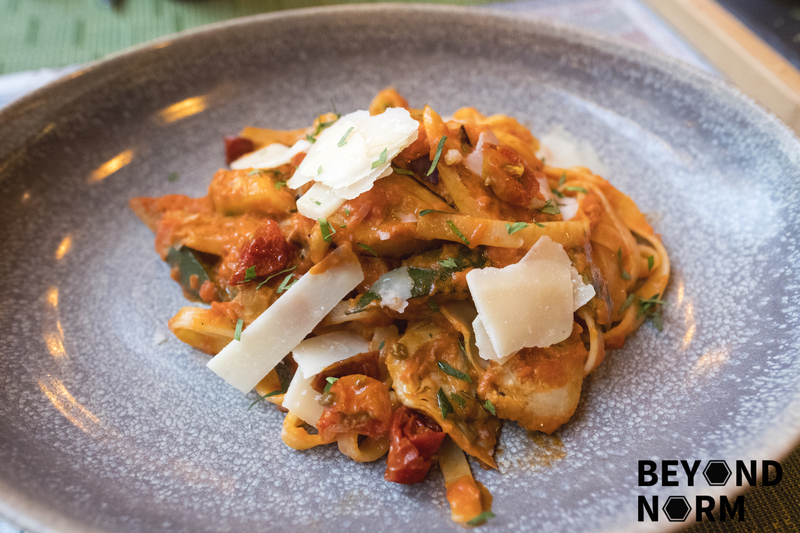 Fettuccine from the Farm ($25) is a vegetarian dish with the core flavours of a delicious pasta. The fettuccine had a slight bite to it and held the nice rustic sauce well. The dish was served with a generous variation of artichokes, sun-dried tomatoes, grilled zucchinis, and eggplants. Of course after that feast, we had to end the meal with some desserts! The Mini Crème Catalane Tart ($14) with lemon sorbet was a great palate cleanser. I would have preferred if the tart was slightly bigger but it was delicious nevertheless. I especially loved the lemon sorbet which is rather sour. However, if you’re adverse to sour flavours, perhaps this isn’t your choice of dessert. Next, we had the Churros ($12) with hot chocolate sauce and crème fraiche. 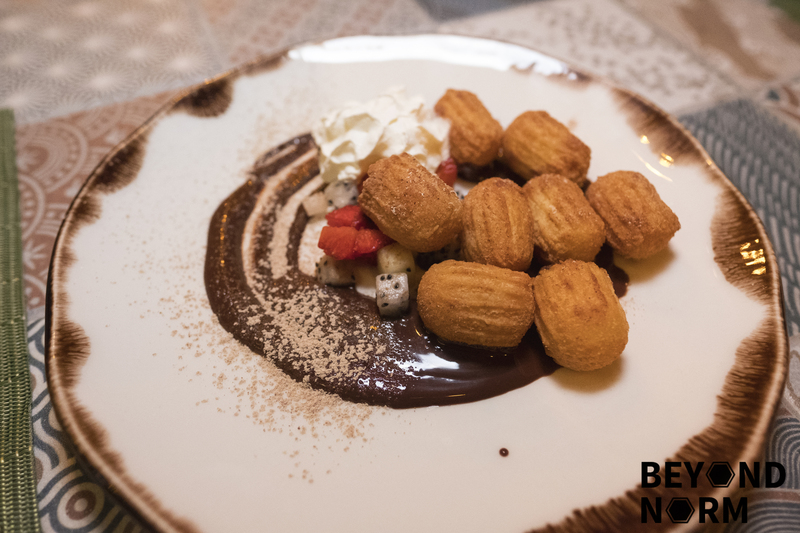 The texture of the churros was perfectly crispy on the outside and yet soft and chewy in the centre. 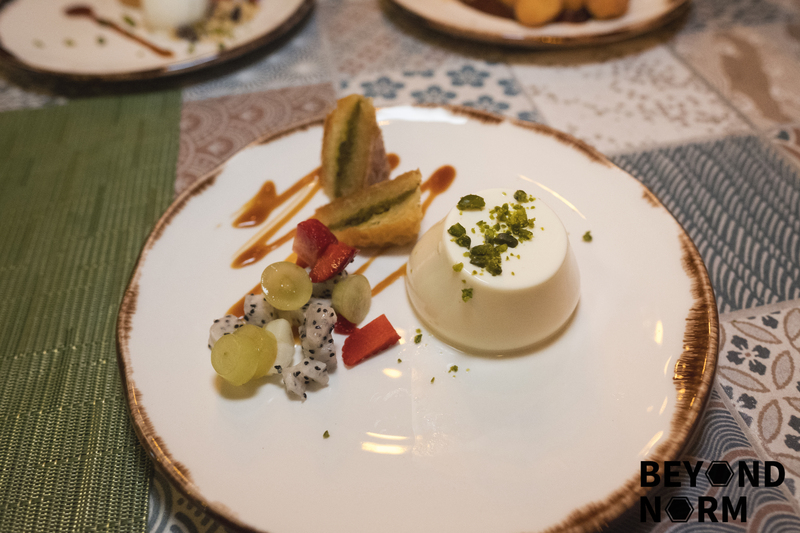 Finally we had the Vanilla Panna Cotta ($14) with Baklava, Pistachio and Salted Caramel Sauce. The panna cotta was so unbelievably smooth that it will melt in your mouth. 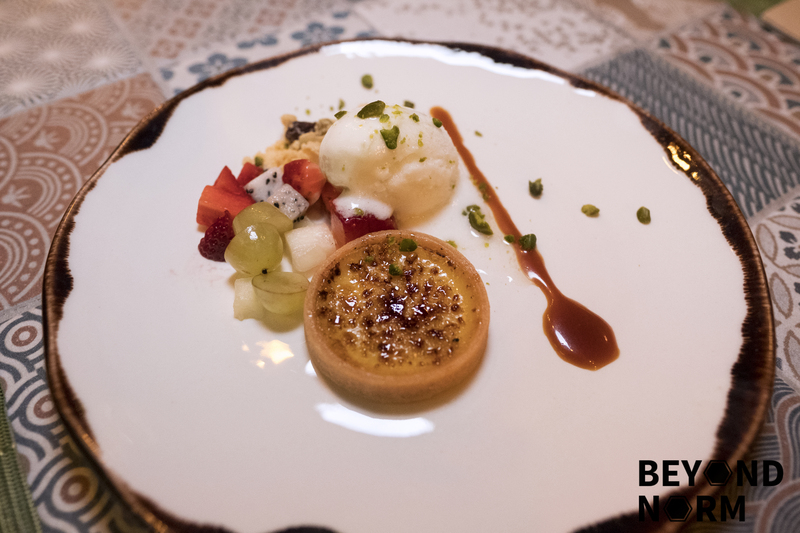 The creaminess of the panna cotta melds well with the sweetness of the baklava. Overall, we had a unique dining experience at Winestone. The food here has a wide variety of textures and medley of flavours. The staff are friendly and always willing to help. 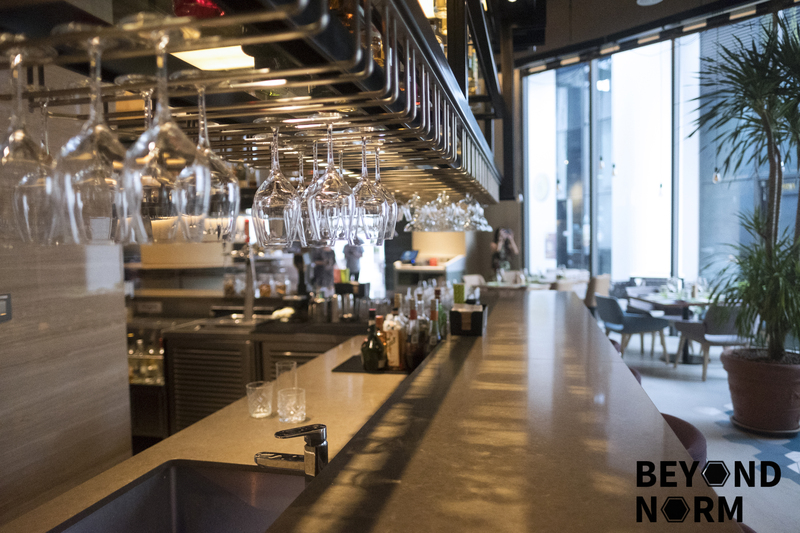 If you’re looking for a new place to try out, Winestone is a great place for family and friends alike. It also has a quieter and more secluded feel than most establishments do. They also have a lunch menu which mostly consists of the highlights of the dinner menu. They serve a Set Meal ($35++ per person) which includes a starter, a main, and a dessert. However the set lunch portions are smaller than what you get for dinner.